NEW: Obama: Incident shows "how race remains a factor in this society"
NEW: Mayor says: "This can't happen again in Cambridge." Arresting officer: "It is for certain that [I] will not be apologizing"
(CNN) -- President Obama said that police in Cambridge, Massachusetts, "acted stupidly" in arresting a prominent black Harvard professor last week after a confrontation at the man's home. 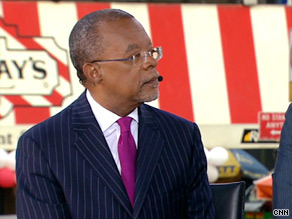 Harvard University professor Henry Louis Gates Jr. talks Wednesday about his ordeal with Cambridge police. "I don't know, not having been there and not seeing all the facts, what role race played," Obama said Wednesday night while taking questions after a White House news conference. Cambridge authorities dropped disorderly conduct charges against Henry Louis Gates Jr. on Tuesday. Obama defended Gates on Wednesday night, while admitting that he may be "a little biased," because Gates is a friend. The mayor of Cambridge said she is going to meet with the city's police chief to make sure the scenario that caused Gates' arrest does not happen again. Gates said Simmons called him to apologize. He told CNN on Wednesday that although charges had been dropped, he will keep the issue alive. "This is not about me; this is about the vulnerability of black men in America," Gates told CNN's Soledad O'Brien. Have race relations improved since Obama's election? Gates said he'd be prepared to forgive the arresting officer "if he told the truth" about what the director of Harvard's W.E.B. Du Bois Institute for African and African American Research said were "fabrications" in the police report. The officer, Sgt. James Crowley, told CNN affiliate WCVB earlier Wednesday that he will not apologize. "There are not many certainties in life, but it is for certain that Sgt. Crowley will not be apologizing," he said. CNN could not confirm Wednesday night that an apology was made. Cambridge Mayor E. Denise Simmons did not respond to requests by CNN for comment. The report said Gates initially refused to show the officer identification, but eventually produced a Harvard identification card, prompting Crowley to radio for Harvard University Police. "While I was led to believe that Gates was lawfully in the residence, I was quite surprised and confused with the behavior he exhibited toward me," Crowley said, according to the report. Gates was arrested for "loud and tumultuous behavior in a public space" and was released from police custody after spending four hours at the police station. He said Wednesday that he and his lawyers were considering further actions, not excluding a lawsuit. Gates said that although the ordeal had upset him, "I would do the same thing exactly again." Earlier this week, a prosecutor dropped the charge against Gates and the city's police department recommended that the matter not be pursued.